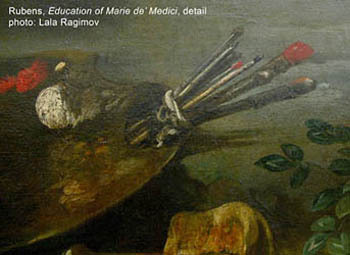 Rubens palette, painting materials, technique, bibliography. Other historic technique pages, Lala Ragimov. This information comes from restoration and conservation articles listed in the bibliography. Almost all these colours are available through historic pigments suppliers (Kremer Pigments, Natural Pigments, Zecchi, Натуральные пигменты, Рублёвская палитра, etc). Some like Natural Pigments and Michael Harding even sell them in tubes. I make my own paint and work with most of these colours every day, and I would encourage any artist to give them a try. canvas: usually tabby weave linen with a double oil priming: a yellowish or reddish thicker layer (yellow or red earths, chalk, sometimes small quatities of other pigments) covered with an opaque thinner grey or buff layer (lead white and charcoal black). 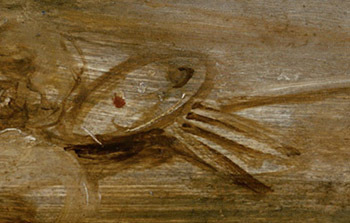 on panel, note the streaky imprimatura. Brown, Christopher. Rubens's Landscapes: Making and Meaning, London: National Gallery London, 1998. Bruce-Gardiner, Robert and Helen Braham. “Rubens's Landscape by Moonlight”, The Burlington Magazine, vol. 130, no. 1025, (1988), 579-596. Buck, Richard. “Rubens's The Gerbier Family; examination and treatment”, Studies in the History of Art (1973): 32-53. Boersma, Annetje, Friso Lammertse and Alejandro Vergara. “Catalogue”, Peter Paul Rubens. The Life of Achilles, (Rotterdam: NAi Publishers, 2003). Cardinali, Marco, Maria Beatrice De Ruggieri, Claudio Falcucci. "I dipinti di Rubens alla Vallicella: Studio della tecnica esecutiva" in La festa del colore: Rubens alla Chiesa Nuova, ed. Anna Gramiccia. (De Luca Editori d'Arte, 2005), 39-63. Doherty, Tiarna, Mark Leonard and Jorgen Wadum. “Brueghel and Rubens at Work: Technique and the Practice of Collaboration”, Rubens and Brueghel a Working Friendship. (Los Angeles: The J. Paul Getty Museum and the Hague: Royal Picture Gallery Mauritshuis in association with Waanders Publishers, Zwolle, 2006), 215-251. Fisher, Sarah. “The Finding of Erichthonius”, Allen Memorial Art Bulletin, vol. 38, no.1 (1980-1981): 21-37. Fabian, Daniel. “Wan eim ein geschossener Pfeil im Lieb ist plieben”, Hommage à Paolo Cadorin; l’amour de l’art, (1999), 117-126. Goetghebeur, Nicole; Guislain-Wittermann, Régine; and Masschelein-Kleiner, Liliane. "Painting Technique", Bulletin (Institut Royal du Patrimoine Artistique), vol. 24 no 182 (1992): 119-138. Keith, Larry. “The Rubens Studio and the Drunken Silenius Supported by Satyrs”, National Gallery Technical Bulletin, vol. 20 (1999): 96-104. Kirby, Joe. “The Painter’s Trade in the 17th Century,” National Gallery Technical Bulletin, vol. 20 (1999): 5-49. Lammerste, Friso. “Small, larger, largest. The making of Peter Paul Rubens’s Life of Achilles”, Peter Paul Rubens. The Life of Achilles, (Rotterdam: NAi Publishers, 2003), 11-31. Plesters, Joyce. “Samson and Delilah: Rubens and the Art and Craft of Painting on Panel”, National Gallery Technical Bulletin, vol. 7 (1983): 30-49. Nykogosyan, Mariam. "Susanna and the Elders from the Rostov Regional Museum of Fine Arts; the lost painting of Rubens' studio? ", VDR Beitrage zur Erhaltung von Kunst- und Kulturgut, (2005): 28-37. Roy, Ashok. “Rubens’s Peace and War”, National Gallery Technical Bulletin, vol. 20 (1999): 89-95. Saunders, Linnaea. “A Rubens Portrait Re-examined”, AIC Paintings Specialty Group Postprints, vol. 18 (Minneapolis: June 8-13, 2005), 76-83. Stols-Witlox, Maartje, Tiarna Doherty and Barbara Schoonhoven. "Reconstructing seventeenth-centrury streaky imprimatura layers used on panel painting" inPreparation for Painting, the Artist's Choice and its Consequences. (London: Archetype Publications, 2008), 79-89. Wadum, Jorgen. “Latest News from Paradise a Preliminary Attempt to Identify Rubens's Studio Practice, Part II”, Preprints of the ICOM Committee for Conservation 13th Triennial Meeting, (Rio de Janeiro, 22-27 September 2002), 473-448. Wallert, Arie. Still Lifes: Techniques and Style, (Amsterdam: Rijksmuseum Amsterdam; in association with Waanders Publishers, Zwolle, 1999).